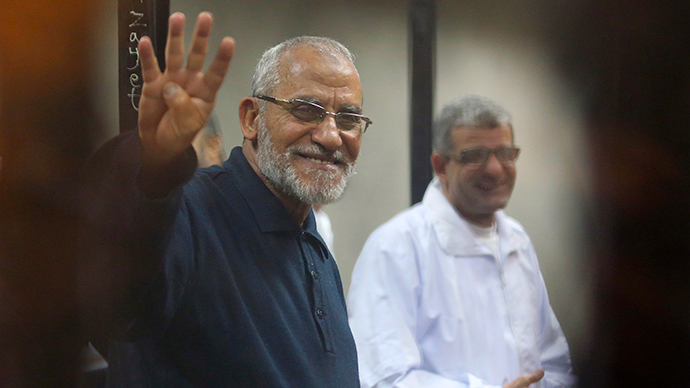 Mohammed Badie, the leader of Muslim Brotherhood’s Egypt branch and 13 other senior members of the outlawed group, were sentenced to death Saturday. The current government in Cairo maintain that the Muslim Brotherhood remain a serious security threat. HRW also slammed a recent decision by the White House to resume arms shipments to Cairo. The human rights body says Egypt is persecuting journalists and political opponents. The US regards the African nation as a strategic ally in the Middle East in the fight against terrorism and Islamic extremism. Mohammed Soltan, who is an American Egyptian, is one of those who has been given a life sentence. He was found guilty of supporting the Islamist group and spreading lies. The US condemned the verdict, while an online campaign to free him says he was not a member of the Muslim Brotherhood. They add he only spoke to the international media in 2013 because he was able to speak Arabic and English fluently. The men were among thousands arrested during protests after Islamist President Mohamed Morsi, who was democratically elected, was toppled in 2013 by the military under the leadership of Abdel Fattah al-Sisi, who is now president. The case has been called “The Rabaa Operations Room” by the local media in reference to protests in Rabaa Square in 2013. Security forces killed hundreds of people demonstrating against the overthrow of Morsi. The Egyptian government defended their actions and insist that protesters were given the chance to leave peacefully and some armed Muslim Brotherhood supporters incited the violence. The international community has largely rejected these claims. Sarah Whitson, HRW’s executive director for the Middle East and North Africa, called the trial “a sham proceeding”. "It appears that the case against Muslim Brotherhood members leading to death sentences of 14 men is politically motivated. The fact that those who publicized the mass killings of 2013 could go to prison for life while those who did the killings receive official accolades perfectly symbolizes the abject failure of transitional justice in Egypt," she said. Those convicted may appeal the verdicts in Egypt’s highest civilian court.